Featuring the perfect blend of sweet and savoury flavours, these saucy meatballs are sure to become a new family favourite. Reserve 1/2 cup barbecue sauce for later use. Mix remaining sauce with all remaining ingredients just until blended. Roll into 1-inch balls; place on parchment-covered rimmed baking sheet. Transfer meatballs to casserole dish sprayed with cooking spray; drizzle with reserved barbecue sauce. Bake 10 to 15 min. or until meatballs are done (160ºF). 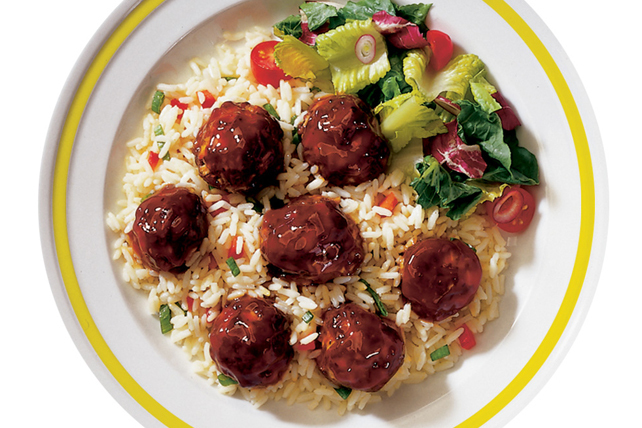 Serve with hot cooked long-grain rice, and a mixed green salad drizzled with your favourite Kraft or Renée's Vinaigrette. Prepare using extra-lean ground chicken or turkey.